The alleged killer of a college student whose body was found with over a dozen stab wounds and buried in a California park, has reportedly told police he was reacting to advances made by the victim. 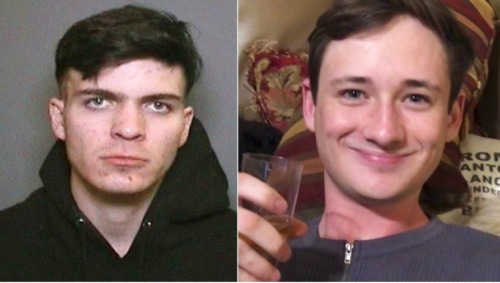 Blaze Bernstein, a 19 year-old pre-med student at the University of Pennsylvania who was home on break, went missing from his parents’ home in early January. His body was discovered on Jan. 10, and police were able to identify former high school classmate Samuel Woodward, 20, as a person of interest based on Bernstein’s Snapchat postings. A law enforcement source told the Los Angeles Times, speaking on conditions of anonymity, said Woodward claimed Bernstein kissed him. Orange County District Attorney Tony Rackauckus has said that investigators are looking for evidence that would support arguing that the killing was a hate crime. “If it is determined that this was a hate crime, we will cry not only for our son, but for LGBTQ people everywhere that live in fear or who have been victims of [a] hate crime,” his parents, Gideon Bernstein and Jeanne Pepper Bernstein, have said. Woodward was arrested on Friday after DNA evidence linked him to the crime. When asked by detectives about abrasions he had on his hands, as well as his dirty fingernails, Woodward reportedly said they were the result of a “fight club” with which he was involved. He also claimed to have gone over to a girlfriend’s house after dropping Bernstein off, but was unable to provide her last name or address. Woodward has been charged with one count of felony murder with a sentencing enhancement of the personal use of a knife. He faces a maximum sentence of 26 years to life if found guilty. Bernstein has been remembered by friends and family as a caring person, and a talented writer and chef.